In writing up this Review for the Shoei RF 1200 Helmet, I thought I share my personal experiences and include what happened to me. It is my intend that this article offers you a comprehensive insight for a Shoei RF 1200 Helmet Review that you will find useful. I hope you find this article helpful. This helmet does its job of fulfilling expectations. Since Shoei set out to reduce the size of the shell and providing a comfortable aerodynamics and ventilation, along with adjustable seal visor. This has crystallized into a powerful quite helmet that is highly stable. Indeed the silence is so deafening, you could ride with the vents closed and still hear the increase of turbulence when opening individual vents. This is a plus as they flow a plentiful air supply. If you fit the chin curtain provided and then make sure that you have ratchet the visor securely, you will be all set for a good ride for many hours. Firstly I experienced a crash but I am still here to tell the tale! More of that later. Firstly, the helmet is extremely comfortable to wear while also making me feel safe. In my conclusion you could wear this helmet indefinitely until you wear it out and had to replace it. That was my observation, however, I end up replacing it due to my crash. All I can say is if you wear the Shoei RF 1200 correctly and you experience a crash then it will certainly pay off in protecting you. The crash was the result of a deer racing in front of me, that caused me to ‘knee jerk’ the bike. The end result was not a pretty one and I ended up landing on my side and my head bounced off the gravel and the verge, which was grass and soil. Due to shock I was ‘paralyzed’ as I could not move but the helmet kept my neck and head comfortable even though I was lying in gravel and soil. Eventually the emergency services arrived, after evaluating the situation, they wanted to take off the helmet. They had to do this without moving my head and neck. The point I wanted to make here is that the paramedics were able to take of the helmet without moving my neck since the helmet has ’emergency’ take out tabs. This resulted in moving the helmet without hardly moving my head. After being examined at the hospital, people were amazed and astonished of how I had no neck or head injuries. The crash was quite severe with me being thrown of the motorcycle, yet I had no injures and only minor scratches and bruises. So what I am saying from my experience is that the helmet did its job with every ‘i’ dotted and every ‘t’ crossed. 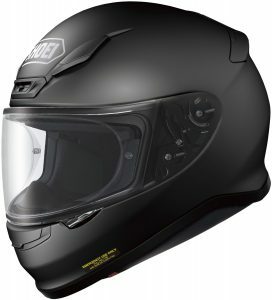 Certainly I would buy another Shoei RF-1200 helmet, which I did when I invested in a new motorcycle. In using this helmet I felt more freedom with turning my head both ways and not feel restricted with ‘blind spots’ and could actually see. In fact, I would say that you will not feel like you are wearing a helmet since the visor shows you everything. In my experience I had a more panoramic view than with other helmets. It did feel quite freeing. In addition a fog-free feature is provided, which is really handy if you live in an area where mist or fog is common. In others I had to wipe away to make sure the visibility was safe during foggy weather. The helmet is elegant and looks sophisticated. Also importantly it is a quiet helmet to help you with reducing noise pollution which is something you need to look at with protecting your hearing. This helmet will certainly pay dividends in the long term and you can be sure it will help you stay safe.